The widely predicted future large scale use of hydrogen in both maritime and land-based industry will require vessels tailored for transportation and bunkering of liquefied hydrogen. 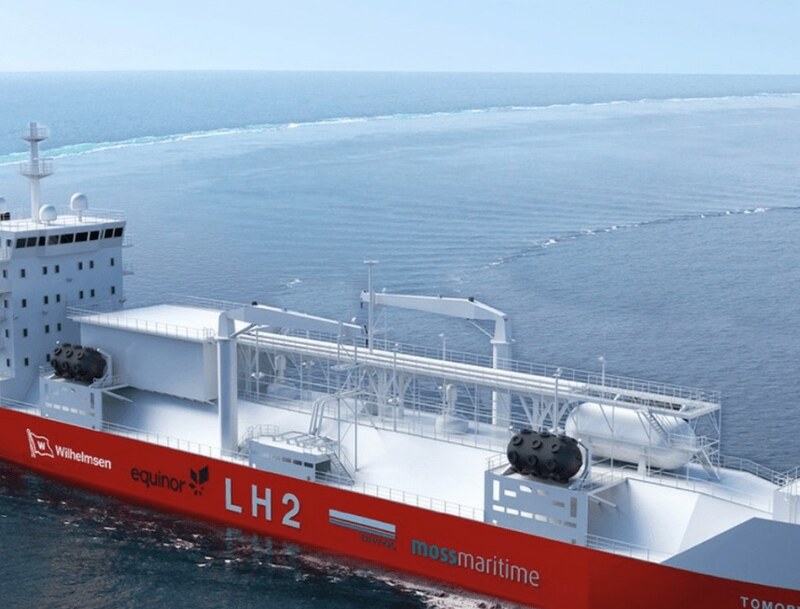 In response, Moss Maritime, in cooperation with Equinor, Wilhelmsen and DNV-GL, has developed a design for a Liquefied Hydrogen (LH2) bunker vessel. The design project, sponsored by Innovation Norway, was launched to clarify challenges and find solutions for storage and handling of this demanding cargo and fuel on a vessel. "Moss Maritime has utilized its long-standing experience from design of Moss LNG carriers in the development of the LH2 bunker vessel, where liquefied hydrogen at a temperature of -253 °C will offer advantages over pressurized hydrogen gas in relation to transportation costs", says Tor Skogan, Vice President LNG of Moss Maritime. "We are ready to support the ship industry in implementing solutions for liquefied hydrogen for future projects." The LH2 bunker vessel has a cargo capacity of 9,000 cu.m, with a cargo containment system designed to maximize insulation performance and meet the most stringent safety requirements. The vessel has been developed to provide liquefied hydrogen bunkering services to merchant ships, in addition to open sea transport. "Equinor believes hydrogen may represent an attractive energy solution for the sectors that are hard to decarbonize and currently outside the scope of renewable solutions like batteries", says Steinar Eikaas, VP for Low Carbon Solutions at Equinor. "Long haul maritime shipping is one of these and an important milestone has been passed by introducing a logistical solution for transport of liquefied hydrogen by the sea." "We see hydrogen as a possible fuel for the future," says Håkon Lenz, VP Europe and Americas of Wilhelmsen Ship Management. "The commercial feasibility of such a vessel is depending on the overall hydrogen market development. Once market signals show that there is a need for big scale liquefied hydrogen, we and our partners are ready to take this design to the next level. By initiating and participating in this project we prepare ourselves for meeting the demand of our customers in the years to come, and Wilhelmsen will always seek opportunities in new technology to enable sustainable global trade,"